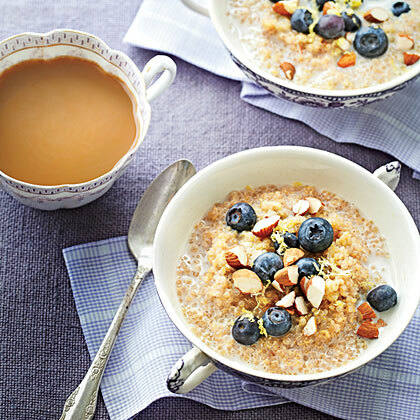 Carolyn says: "Quinoa, a nutty seed packed with protein, is great for breakfast. Its firm texture is perfect in this creamy porridge." 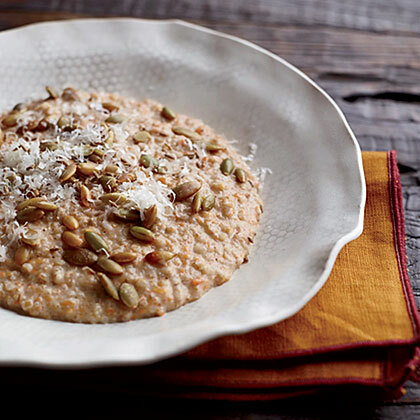 Dan Barber is a big proponent of using whole grains, which are healthier and more delicious than the processed kinds. One of the grains he's most keen on is emmer wheat, also known as farro, which he uses in this savory, carrot-rich dish. Wylie Dufresne is a genius at using avant-garde techniques to turn everyday ingredients into miraculous dishes. For instance, at his Manhattan restaurant WD-50, the revamped menu includes chicken confit with peas and carrots: The "peas" are actually carrots coated with freeze-dried pea powder. 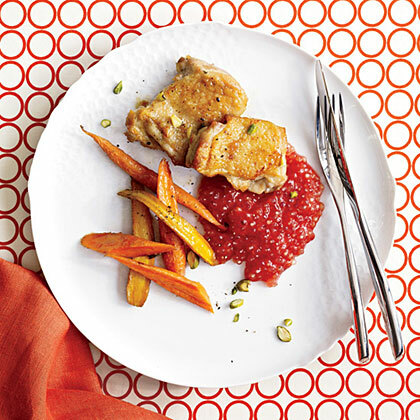 But when F&W challenged the Top Chef Masters contestant to create a fast recipe, he simply roasted the carrots to serve with chicken and tomato-infused tapioca porridge. It takes three chefs 12 hours to prepare the WD-50 dish, but less than an hour for a home cook to make this one. 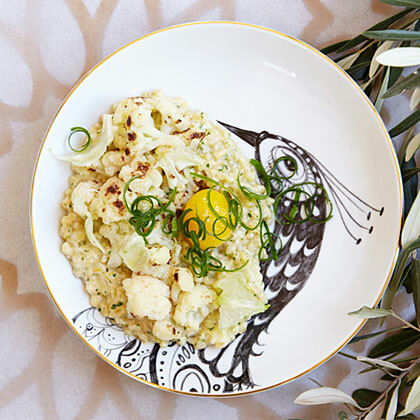 Corey Lee's summery porridge is a cross between traditional Chinese congee and Italian risotto. 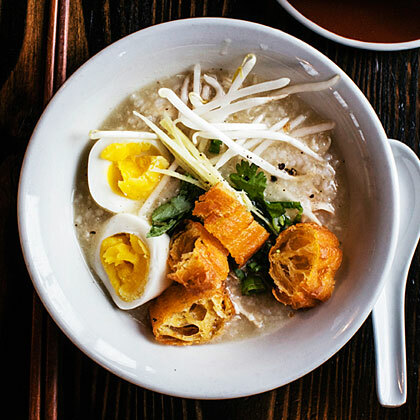 Congee and its variants are a staple throughout Asia, including Vietnam, where you'll most commonly find people eating the comforting, soupy rice porridge at breakfast. Chef Eric Banh grew up in Saigon and created this rich chicken version for his Seattle restaurant Ba Bar. He adds that it's good too "as a midnight snack after you drink a lot." Most of the work for the congee can be done ahead. 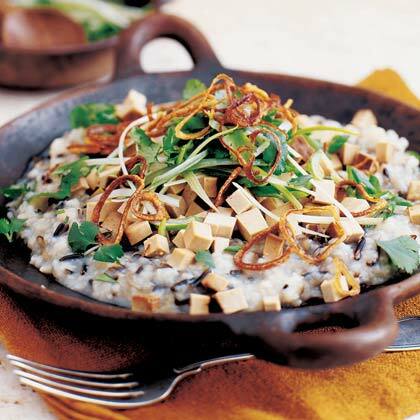 Jook - also known as congee - is eaten in Chinese communities around the world. Despite its odd name, it has wide-ranging appeal and has become one of the author's favorites. The dish takes many guises in restaurants but can easily be made at home. Use it as a side dish with chicken, pork, or beef. You can also stir in fish, shrimp, chicken, or cooked egg to make it a main dish. While glutinous sushi rice gives the dish a sticky-creamy texture, Arborio retains more of its bite after the long cooking time for added texture. 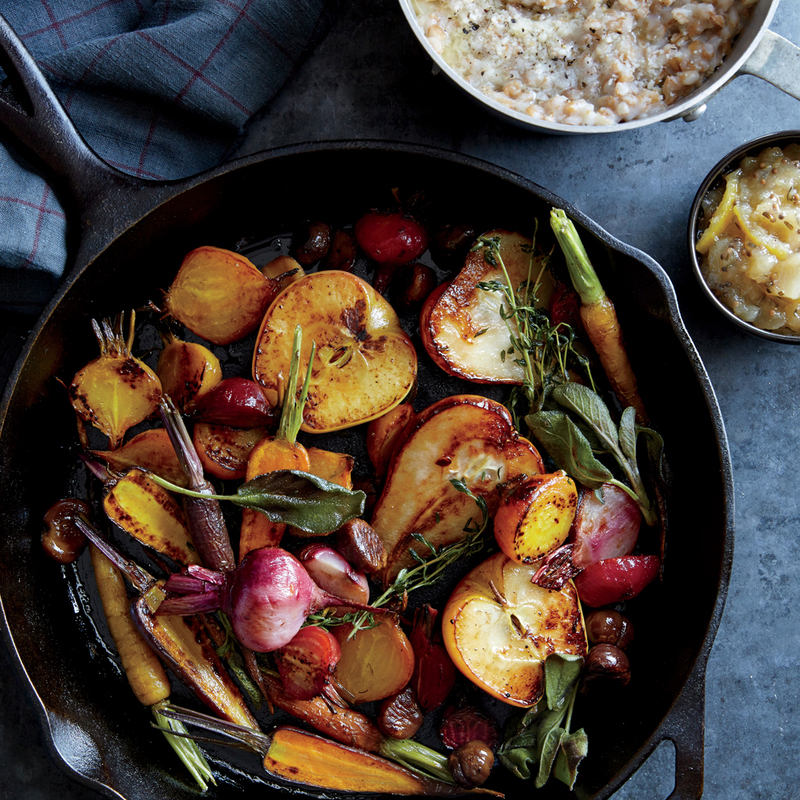 This rustic dish serves as a tutorial for both steam- and dry-roasting. 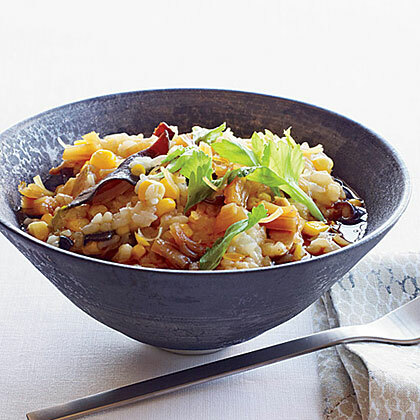 Serve the fruit and vegetables with the savory farro porridge and sweet-sour mostarda for brunch, a vegetarian main course, or a festive side dish. Recipe adapted from Slow Fires. Copyright 2015 by Justin Smillie. Published by Clarkson Potter/Publishers, an imprint of Penguin Random House LLC. $40, 320 pages. 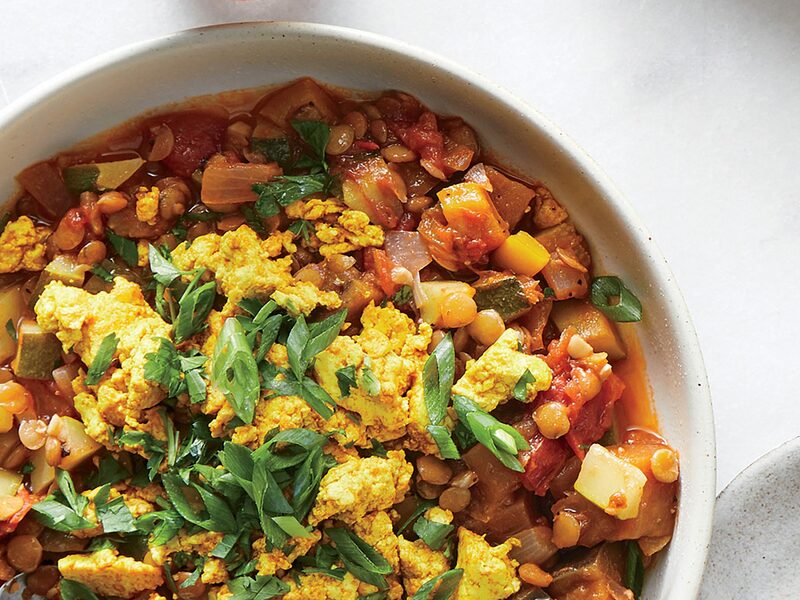 Serve this hearty morning warmer on a lazy Saturday--or even a weekday, if you make it ahead. 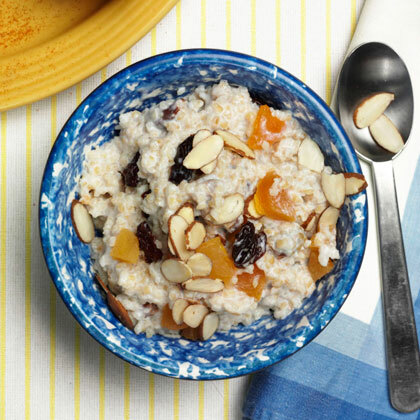 This dish features rolled oats and wheat berries, products of the Montana-Dakotas region. Time: 20 minutes. The addition of rhubarb and maple syrup is an unusual and delicious twist to morning porridge. This dish is inspired by a Moroccan porridge called herbel, which Mourad Lahlou's mother and grandmother used to cook for him. It's traditionally made with barley, milk, butter and cinnamon, but Lahlou likes doing it his own way, substituting other grains such as farro instead of barley. 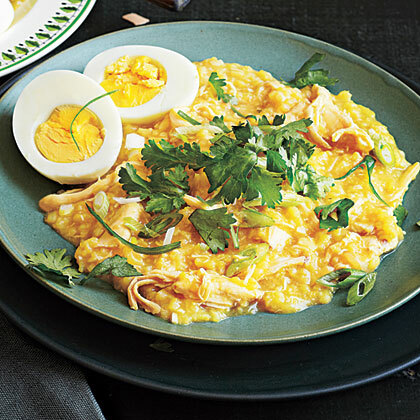 Whiffs of ginger, shallot, and saffron perfume this comforting porridge. True, saffron is the world's most expensive spice, but if you buy in small envelopes, it only costs about $2.50. 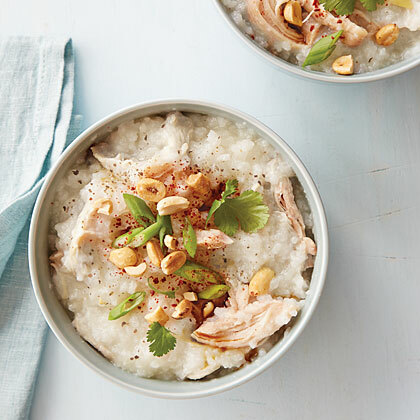 Heat-seekers can dot the porridge with Sriracha, or for milder spice, drizzle with sweet chile sauce. Polenta is cornmeal boiled into a porridge and usually eaten baked, fried or grilled. It is the not-so-secret ingredient in this moist cake with amaretto soaked oranges. 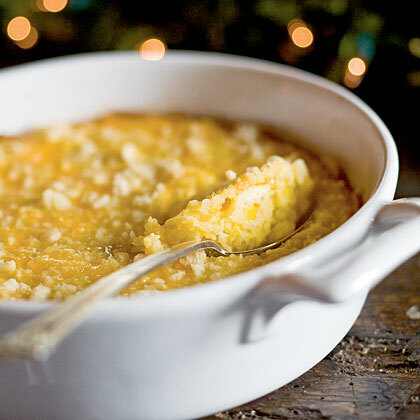 Corn pudding evolved from the popular colonial Indian pudding, which was itself a cornmeal adaptation of flour-based English porridge. This dish makes an excellent side at Thanksgiving or Christmas dinner, and kids love it! While you might not think of turning bulgur into porridge, it’s a delicious whole-grain breakfast with a texture similar to instant oatmeal. 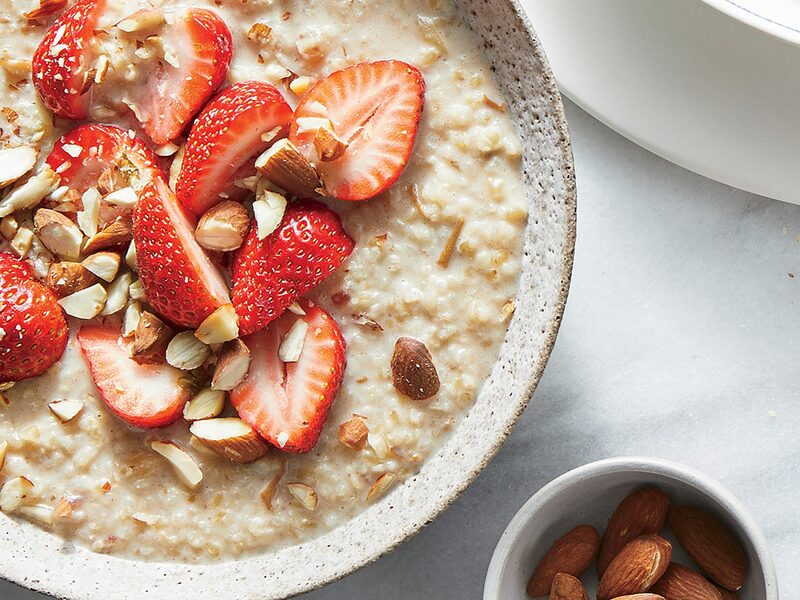 Mashed dates naturally sweeten and enrich almond milk for a creamy, satisfying bowl. You can make the porridge ahead and simply reheat briefly before serving; add the berries and nuts after heating the bulgur. 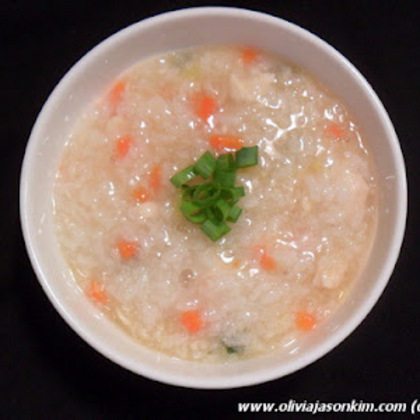 Chinese rice porridge can be expressed in countless ways--from nearly flavorless (expressive of rice and clean water, intended to be restorative) to full-bodied and plentiful (the accoutrements are unlimited in scope). If you can find broken rice at an Asian market, buy it, as it gives a body to congee that no other rice variety can duplicate. Notes: This easy twist on traditional Chinese rice porridge makes a wonderful one-dish supper on a cold night. If desired, top with shredded leftover meat, such as roast chicken, duck, or pork. Baked tofu, found in the refrigerator case of natural-food stores and many supermarkets, is available in several flavors; any will work here.